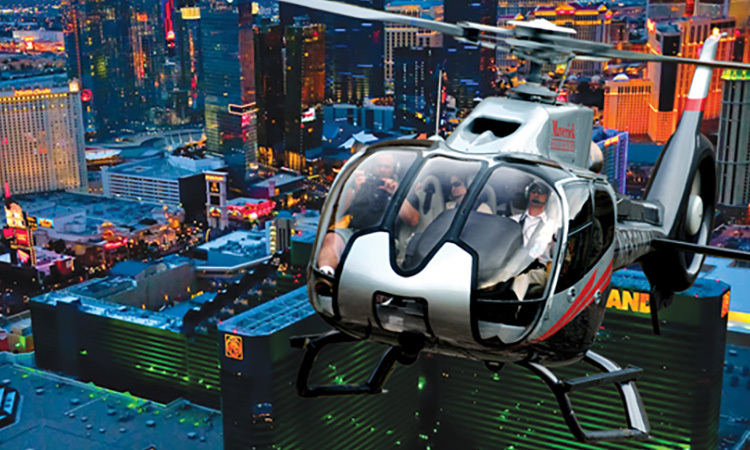 Climb aboard a luxuriantly appointed helicopter to see Vegas and the Southwest from an exciting new vantage point. Experience the Grand Canyon from within, or take in an aerial view of the lights of Vegas. City VIP Concierge is pleased to partner with the premier company in the city, offering helicopter tour packages from a few minutes long to excursions for most of a day. Wherever you choose to fly, you’ll receive the highest level of safety and service in the industry. 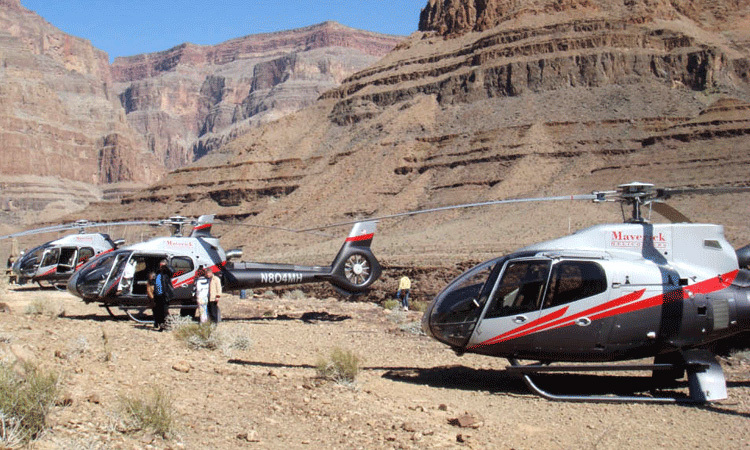 All of our Grand Canyon excursions allow you to experience the Canyon from within, as they descend over 3,000 feet to land in Hualapai Indian Territory. Champagne, beverages, and a light snack will be served on the ground, 300 feet above the Colorado River. Each tour also includes transportation to and from hotels within 5 miles of the Strip, free of charge, and lasts four to four-and-a-half hours long. Take a quick jaunt, for pleasure or transit, with our two short-flight packages. Enjoy the “City of Lights” from the sky with Vegas Nights, a 12-15 minute tour of the Strip. Prior to your departure from our terminal, you’ll be served champagne to toast your night flight. Our EcoStar helicopter, the “limousine of the sky,” will show you the New York skyline, the Bellagio fountains, the Luxor pyramid, and the other classic resorts, all for $124 per person. The Wind Dancer Air and Landing Tour flies over Lake Las Vegas, Lake Mead, the Hoover Dam, and Fortification Hill, before coming to rest in the Grand Canyon; you’ll view the red rock formations of the Bowl of Fire and conclude with an exciting flight over downtown Vegas, for $544 per person. The Dream Catcher Sunset Tour, which is $574 per person, flies you to Hidden Valley and the Valley of Fire, revealing some of the most remote, desolate, and fascinating desert landscapes, and intricate red rock and sandstone formations. You’ll stop in the Grand Canyon, then conclude by seeing Lake Mead, Fortification Hill, and Hoover Dam before coming home as the lights go on at the Bellagio, Luxor, Paris, and all the other resorts. The Dream Catcher Sunset Tour, which is $614 per person, flies you to Hidden Valley and the Valley of Fire, revealing some of the most remote, desolate, and fascinating desert landscapes, and intricate red rock and sandstone formations. You’ll stop in the Grand Canyon, then conclude by seeing Lake Mead, Fortification Hill, and Hoover Dam before coming home as the lights go on at the Bellagio, Luxor, Paris, and all the other resorts. Our air-only helicopter tours provide breathtaking scenery of the Vegas surroundings, as well as the Strip, during your three to three-and-a-half hour flight. Take the Silver Cloud Air Tour and soar through the Grand Canyon, look down upon the Hoover Dam, and watch the waters of Lake Mead and Lake Las Vegas. You’ll pass Fortification Hill, an extinct volcano, and Glitter Gulch before coming back into the Strip. 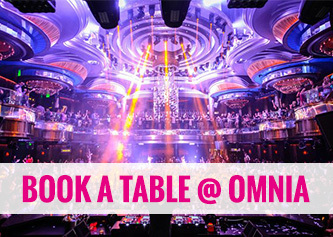 Complimentary transportation is provided to and from the terminal, to hotels within five miles of the Strip, included with your $419 per person tour. For a more dramatic view, book the Silver Cloud Sunset Tour at $449 per person, and see the sights framed by the spectacular setting sun. The lights of Las Vegas will welcome you back to our terminal, where complimentary transportation will return you safely home. ITEMS TO BRING : Camera, sunscreen, photo ID (for anyone 18 yrs or older) and if you should forget anything visit our gift shop. If you want a longer excursion, the Indian Territory Tour lasts for seven hours, giving you more time to explore both the skies and the Grand Canyon area. Fly over Lake Las Vegas, Lake Mead, the Hoover Dam, and Fortification Hill before landing 3,500 feet into the Grand Canyon, in Hualapai Indian Territory. Enjoy champagne and beverages 300 feet above the Colorado River, then board again to fly up the Canyon and land on the West Rim. Learn about the Hualapai legends and culture while enjoying the spectacular views at Eagle Point, then head to Guano Point for more breathtaking scenery and a light meal. You can walk out the Skywalk, take a Hummer tour, ride a horse along the Canyon’s rim, or relax in a horse-drawn wagon: all these and other activities may be arranged for additional fees. 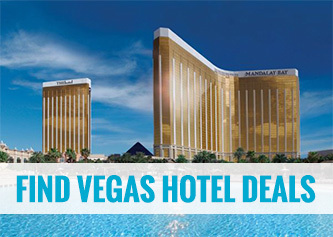 Conclude with a flight through the Valley of Fire and over the Las Vegas Strip, all for $694 per person, including transportation to and from hotels within 5 miles of the Strip. Horseback Rides – Available along the rim of the Grand Canyon. Horse-Drawn Wagon Rides – A wonderful way to experience the Old West. Additional attractions may also be available. All fees for these activities will be collected by Grand Canyon West. 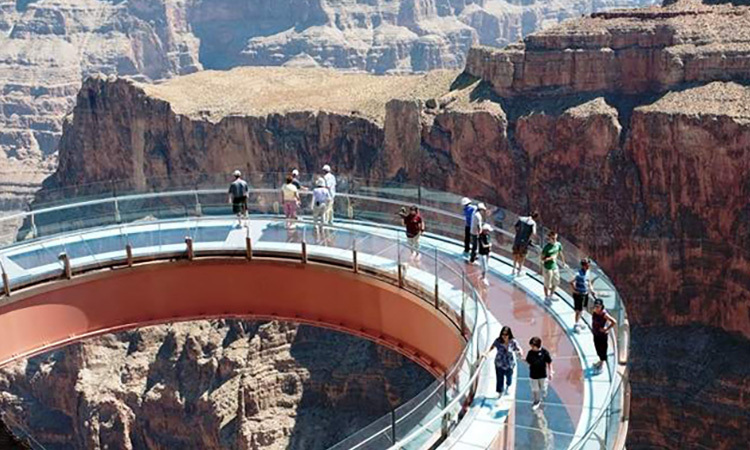 The vision of the skywalk was to enable visitors to walk beyond the canyon walls, becoming surrounded by the Grand Canyon while standing at the edge of a glass bridge. This glass bridge is suspended more than 4,000 feet above the Colorado River on the very edge of the Grand Canyon’s West Rim. The skywalk is an optional activity on this adventure and can be purchased directly through Maverick Helicopters. We are pleased to offer three helicopter tour packages that set the stage for a one-of-a-kind adventure, both in the air and on land. The Skywalk Odyssey Tour, the shortest of the three at four-and-a-half hours, flies you directly to the Grand Canyon Skywalk, passing Lake Las Vegas, Lake Mead, and the Hoover Dam along the way. Upon landing, witness an engineering marvel: the Skywalk juts out more than 70 feet from the edge of the West Rim, and you can look through its glass bottom down more than 4,000 feet to the Colorado River. 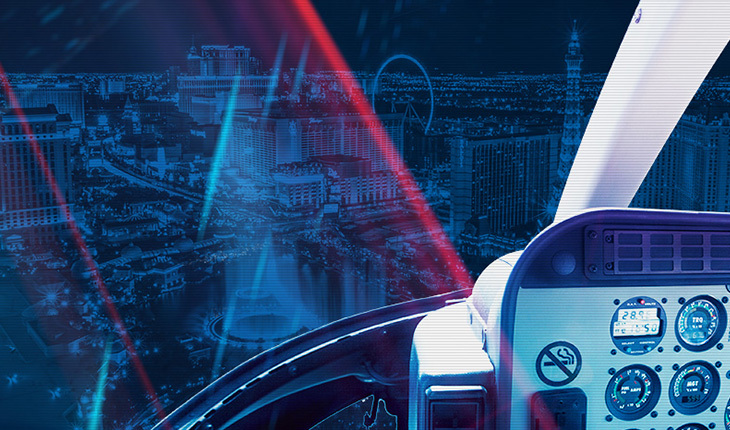 During your 45 minutes on the ground, you’ll receive expedited admission to the Skywalk, VIP ground transportation, and a souvenir photo; in addition, we provide transportation to and from hotels within 5 miles of the Strip. This trip is priced at $574 per person. DEPARTURE TIME : 8 a.m., 9 a.m. and 1:00 p.m.
For a true adventure, book the River Rafting Tour and spend time in the air and in the water. Sweep through the Grand Canyon in a helicopter, seeing a natural wonder of the world like you’ve never witnessed it, and then land at the Boulder City Airport to meet up with the rafting crew. Your fully motorized and narrated river rafting voyage will depart from the base of the Hoover Dam and float 12 miles down the grand Colorado River. The tour includes several stops along the river, plus lunch served upon reaching Willow Beach, Arizona. Before your flight, you’ll be picked up at your hotel within 5 miles of the Strip, and at the conclusion of your rafting tour, the crew will transport you back again, for $629 per person. If you want the speed and style of a helicopter without the sightseeing, book our Nascar VIP Transportation to reach the Las Vegas Motor Speedway in just over 10 minutes. You’ll be dropped off and picked up at your convenience, leaving you feeling like a VIP and giving you more time to visit the pits, get autographs, take in the live entertainment, and shop for souvenirs. This service is $499 per person; limited seating is available, so reserve now. With its all-star DJ lineup, surreal theatrics and the promise of endless excitement, it’s no wonder that the Electric Daisy Carnival has found its home in the fabulous, pulsating city of Las Vegas. 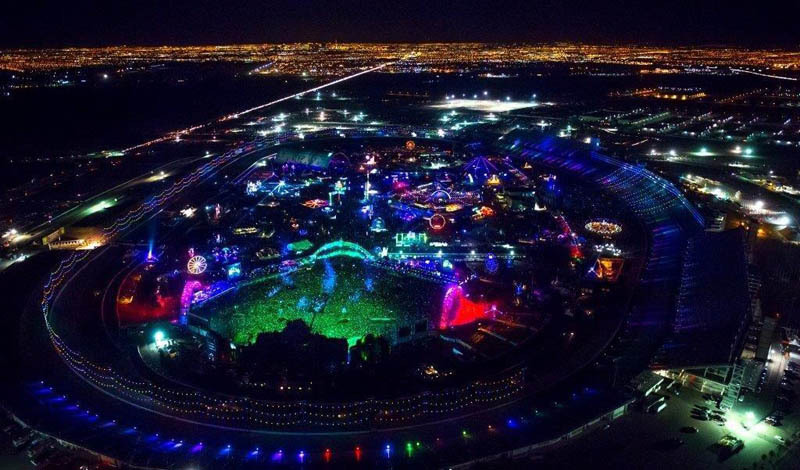 Characterized as the biggest music festival in the country, EDC has captivated throngs of electronic music lovers from around the world. After making its debut at the Las Vegas Motor Speedway several years ago, the popularity of the festival continues to reach new heights. Expected to draw nearly 400,000 guests over the weekend in 2016, EDC will be one of the biggest parties to ever hit Sin City. ITEMS TO BRING : All guests will need a photo ID. EDC is only open to guests 18 or over. Helicopter transfer does not include entrance to EDC. Pick your air adventure and book today for the flight of your life!